We’ve fallen head-over-heels for Emma Wright’s creations and have already asked her to get designing for us! Meet the lady behind the needles. Emma, originally from Sheffield, has managed to do what many of us crafters dream of – she’s launched her own website (emmaknitted.co.uk), designs patterns and has won myriad creative awards. We found out how she became one of the most talked about names in knitting. Emma designed a floral brooch exclusively for The Knitting Network. How did your love of knitting and crochet begin? As a child I was always very creative, my poor old mum was always following me around with the Hoover, picking up the trail of glitter and paper cuttings I’d leave behind me. Ever since I was little, deep down I always knew I wanted to design clothing, so it came as no surprise when I applied to college to study fashion and textiles, and my love for knitting and crochet very shortly followed. My nan taught me to knit when I was really young, I but never took it seriously until I was studying for my fashion and textiles degree at Nottingham Trent. That’s when I became totally glued to my yarn and needles, and it’s safe to say that I haven’t put them down since. As for crochet, a few years ago I learned how to do it from YouTube. You can teach yourself anything on there these days! Presumably knitting machines were involved in your degree? I was studying. Although I love the quality of fabric a machine can produce, there are a great many more things you can do with fabrics knitted by hand. What was the first item you made? When we were on a seaside holiday when I was little, Dad bought me some yarn and I knitted myself a scarf. I think the yarn was Rowan. I went with a simple rib and some great long tassels – everyone loves a yarny tassel! When did you realise knitting and design could be your career? 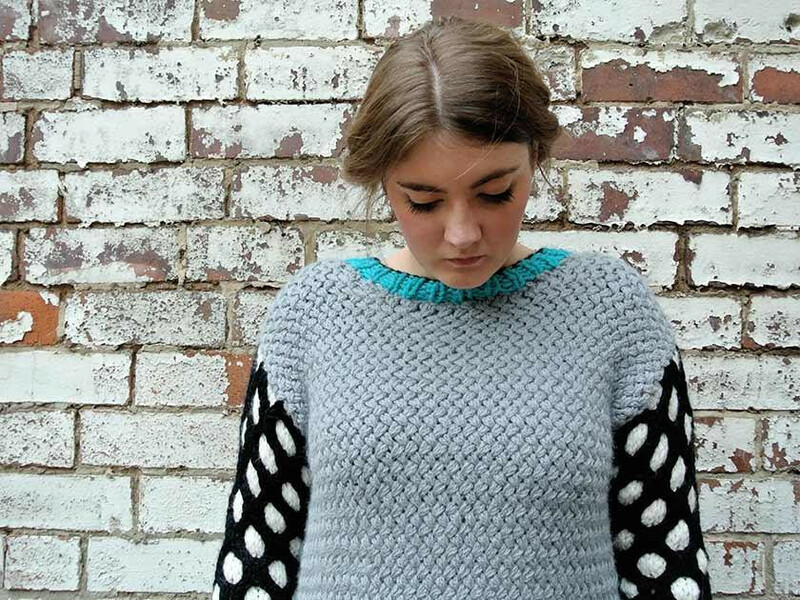 My big break definitely came when I went to work with knitwear designer Louisa Harding as a part-time design assistant. And I’ve been lucky to work with many other amazing editors and inspirational knitwear designers over the years. Who does all the hard work at Emma Knitted? of knitters. My boyfriend Lewis is a very talented illustrator which comes in handy, and my family are incredibly supportive. They always swoop in to lend a hand when I’m working to a tough deadline. I don’t know what I’d do without them! I have a little design studio hidden away in the spare room at my grandparents’ house. I live with both of my parents, my brother, sister and three noisy terriers – so I can find a bit of peace and quiet by going there. I only get time for a holiday about once a year so I try very hard not to take my work with me when I go away, but that almost never happens! How do you keep your design studio organised? I don’t believe it’s possible to be both creative and tidy! Knits just seem to keep popping up until it gets to the point where it looks like a yarn bomb has gone off in there, it’s how I like it! But when it gets too out of control, I have a bit of a tidy up to clear my head, and then the process starts all over again. Who are your biggest influences in the knitting design world? I love the wearable, timeless style of Erika Knight’s designs, and the quirkiness of everything by Louisa Harding. I’m also inspired by Gucci, Chanel and Orla Kiely. If you could design absolutely anything, what would it be? I’d really love to design a whole wardrobe of pretty knitted jumpers for my dog Daisie. It would be so much fun! What sort of projects do you enjoy making most of all? That’s a tough one, because I really do love all forms of knitwear. If I had to pin down a recent one though, it’s the British sheep slippers I designed for Erika Knight, they’d win hands down! What's your favourite yarn on the market at the moment? I’m not fussy, I love yarn in all shapes and sizes. I do have a real soft spot for the Erika Knight British yarn collection, though – it’s fabulous! And I’ve just discovered thefibreco.com, who have one of the most beautiful yarn collections on the market. Their Cumbria yarn in shade Buttermere is especially yummy. Which creative people do you like to follow on Instagram? At the moment, I am really enjoying the feed of Christine Leech (@sewyeah) as well as Emily Quinton (@emilyquinton) who always inspires me to take more photographs and try new things. So what's next for Emma Knitted? I have some really exciting projects and collaborations in the pipeline, but at the moment they’re all top secret! Keep an eye on future issues of Love To Knit & Crochet though (wink wink! ).